A faithful recreation and fun expansion of the arcade original. Alien Syndrome for the PlayStation 2 is something of a unique remake. It’s a standout twin-stick shooter in its own right, paying tribute to the arcade original while also managing to craft an identity of its own. Furthermore, it’s one of the few 3D Ages titles actually worth playing. Whether you import the Japanese original or play it on the North American SEGA Classics Collection, Alien Syndrome is a remake worth noting. Ricky and Mary are deep space exterminators. Responding to distress calls, the duo race from ship to ship, eliminating alien threats and rescuing civilians. A destructive, all-consuming life form known as the Missouri has begun hijacking space craft, trapping or infecting all onboard. The Missouri were initially sought out for their medical and military potential, but broke free from the clutches of their captors. Alien Syndrome barely hides its influences – namely, the Alien franchise (you’ll be storming the Nostrium and battling more than a few xenomorph lookalikes throughout your quest, for example). Needless to say, it wouldn’t take much effort to adapt Alien Syndrome into a full-on licensed Alien product. Whether you’re a space horror junkie or just a fan of twin stick shooters, Alien Syndrome‘s cliché is as charming today as it was in 2004, and in 1987, for that matter. 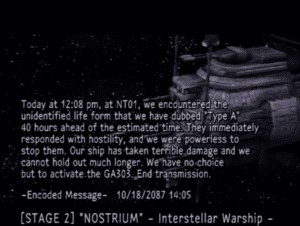 The game’s story plays out between stages via text logs and diary entries scrolling over a backdrop of the afflicted ship in question, never really overlapping with the gameplay. Like any arcade shooter, the game’s narrative isn’t a selling point. Rather, it’s the glue holding the game’s stages together, merely giving our heroes an excuse to shoot more bugs. Each stage in Alien Syndrome begins with your chosen character, Ricky or Mary, setting a time bomb for three minutes. This bomb is set to destroy the craft in its entirety once the timer hits zero. That includes all aliens, civilians, and Ricky and Mary, should they still be present. Your job within this time frame is to rescue the minimum number of civilians dictated, reach the exit, and defeat the boss. Levels are non-linear and often asymmetrical, forcing exploration. A mini-map located in the top corner of the screen helps with tracking down civilians and avoiding enemies, though with such a tight time limit, route planning is a must. Each stage houses its own set of obstacles, be it in the form of open pits or faster and more aggressive enemy types, and one wrong turn can waste the precious last seconds needed to complete a level. To play Alien Syndrome effectively, players will need to experiment with the game’s weapons. Each stage features a new enemy type equipped with its own unique movement and attack pattern, as well as being more or less susceptible to different types of fire. 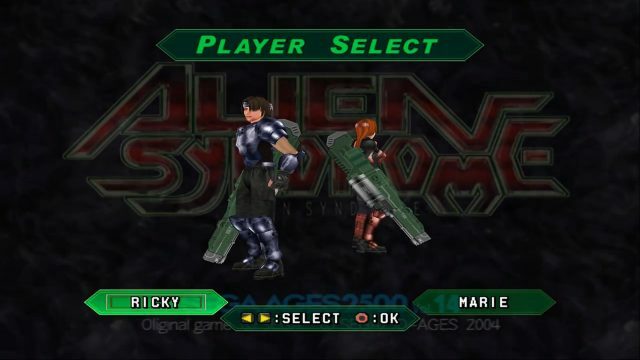 Mary and Ricky begin each stage with a standard rapid-fire rifle, with other weapon types – of which only type can be carried at a time – scattered throughout the stage for pickup. While finding all the civilians hidden throughout can be tricky in the later stages, Alien Syndrome‘s true difficulty comes not from its design or shooting but from a player’s ability to traverse stages effectively. 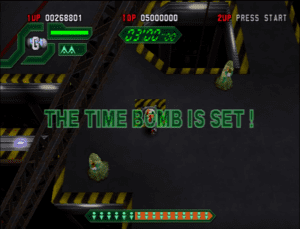 Scores are calculated via time remaining on the clock, shot combos, and enemies killed. This philosophy holds true for the boss battles as well, forcing players to take into consideration the best route in order to maximize weapon pickup efficiency. Shot combos, scored by successive hits without the player taking damage, are a major metric in a player’s overall score. While one could more or less sprint through a stage, only eliminating enemies in their immediate vicinity, the boost in time may not make up for the loss in combo score. The flamethrower, for example, is perfect for the second stage’s boss, allowing you to safely circle-strafe while decimating the boss’s health bar. However, due to its short range, it’s hard to build a shot combo with during the level. Thus, the kind of gun for maximizing your score during a stage may not be the same gun you use to take down the boss, forcing you to rework your route through the level. 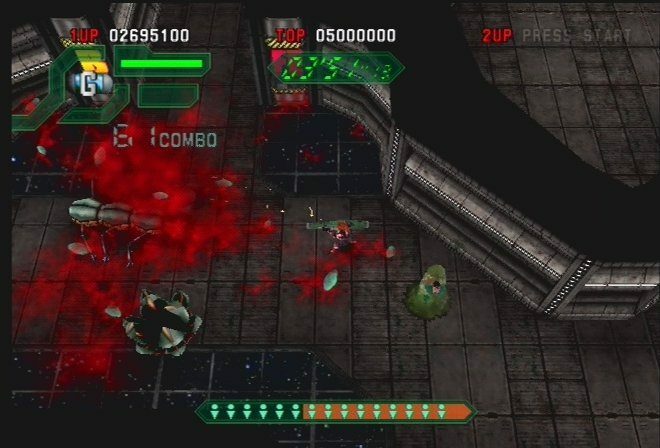 Much like the arcade original, Alien Syndrome on the PS2 is an arcade shooter played from a top-down perspective. The polygonal constructs allow for more camera dynamism than the sprite-based original, though it stays fixed in place for the most part, panning as players walk. The draw distance is about the same as the original as well, allowing for adequate space to react to the oncoming armada while still forcing players to move with caution, ready to react to alien spawn at a second’s notice. Alien Syndrome is a traditional twin-stick shooter, the left stick used for movement and the right for aiming and shooting. This is perhaps the biggest departure from the original game’s formula, as players can dance about while firing instead of having movement and aiming committed to the same direction. Aiming can feel a tad off at times, but players should be able to adapt after a few rounds of play. Alien Syndrome is a budget title, and nowhere is this more obvious than its graphics. Polygon counts are low, making it look more like the port of a Model 2 game than a PS2 title. Character models are blocky and simple, capable of only a scant few animations. Though with most environments being the interior of space ships, the sharp, square symmetry actually works in the game’s favor. Smart texture work and a bird’s eye perspective also help disguise the game’s simple geometry. Sound effects, specifically gun and shot effects, are great, giving each gun a heavy and impactful feel. The music is less praiseworthy, though quiet piano score works for the setting. Alien Syndrome for the PS2 emulates the feel of the arcade original while also modernizing it in a sensible way. Not many of the SEGA Ages collection remakes did such great justice to their source material, let alone were any fun to play (looking at you, Golden Axe). Alien Syndrome is something of an anomaly in this sense, capturing SEGA’s rich arcade legacy with incredible accuracy. Like most arcade shooters, players should be able to complete the campaign after a few tries. However, the true test comes in reducing your usage of lives and continues while maximizing your score. Those with a love of the experimentation and memorization will get a lot of mileage out of Alien Syndrome. I like my martinis dry and my shooters on-rails.